See if you can spot the differences! When the Covered book first began to take shape, we needed a cover design to present on the sales sheets, but didn’t have access to all the book content as compiler Jan’s image scans had yet to arrive. 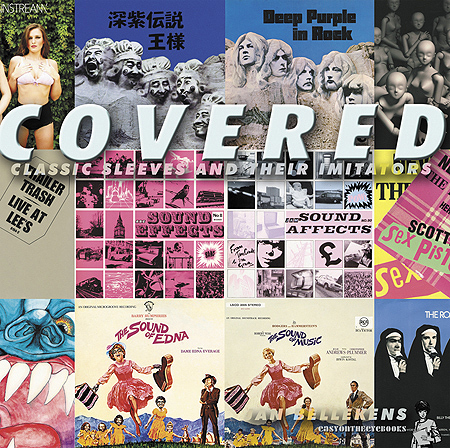 So the design featured some of the copy covers in the Easy On The Eye’s own archive (which has to say something about the eclectic nature of our record collection if nothing else). The originals and copies were shown side by side to put over the concept of the book. 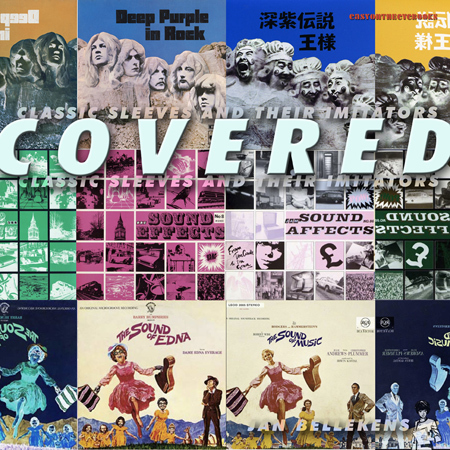 To make up the edges of the cover design, the sleeves were simply reversed to a colour negative. As work on the finished artwork came to a close more recently, the cover needed to be redone using better quality scans of the covers, which were also cleaned up. The opportunity was taken to add sections of extra sleeves to the cover edges, some of which would wrap over onto the flap of the ‘dust-jacket’. As only parts of these would be seen it was important to use covers which despite not being the originals, would still be recognisable to the target audience. Further tweaks to the position of the title, author name and logos also happened at this stage, and one last change was made, with the spoof of the Deviants cover bottom right being felt to be a little obscure (though it’s one of my favourites in the book), so was switched for an anti nuclear protest album cover which takes off Blur.